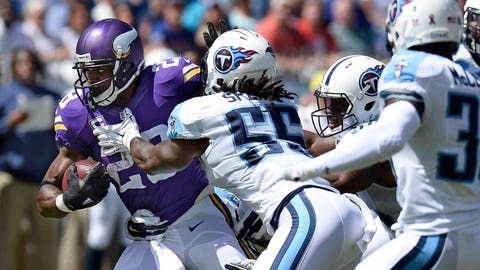 Minnesota Vikings running back Adrian Peterson rushed for just 31 yards on 19 carries in Week 1. It wasn’t the way we expected things to play out, but thanks to a stout defense and a surprisingly crisp passing attack the Minnesota Vikings can head home to U.S. Bank Stadium 1-0 following a 26-15 win over the Tennessee Titans. The Vikings abandoned the expected script in Week 1, limiting an ineffective Adrian Peterson to just 19 carries, opting for heavy dose of Shaun Hill and Stefon Diggs instead. Meanwhile, the defense went to work after a shoddy first half, pummeling Titans quarterback Marcus Mariota into a series of timely turnovers. — Diggs faded last season after emerging as a high-volume target early, but he is clearly Hill’s go-to receiver after Week 1. He was all over the field, and figures to retain that role regardless of which quarterback starts against the Green Bay Packers. — Rudolph was heavily involved against the Titans, and led all Vikings pass-catchers with 58 offensive snaps. The 6-foot-5 tight end is a perennial favorite to break through as a receiver during training camp, and got off to a solid start, catching four of his eight targets for 65 yards. — The score favored Peterson from start to finish, but he was on the field for just 60 percent of the game despite a solid matchup against a questionable Titans defensive front. The end result was a win for the Vikings, but it may be time for Peterson to start suiting up in the preseason. — Sunday was just the third time Adam Thielen has had at least five targets in a game. He racked up 54 receiving yards despite playing just 56 percent of the Vikings’ offensive snaps. — Laquon Treadwell was active but didn’t play. It’s a predictable move for head coach Mike Zimmer and offensive coordinator Norv Turner, who eased Diggs into the offense last season. — Cordarrelle Patterson was on the field for just five offensive snaps. He made an impact despite the limited workload, hauling in his lone target on a six-yard out route to help set up a 45-yard field goal in the fourth quarter. He also picked up eight yards and a first down on a jet sweep in the third. 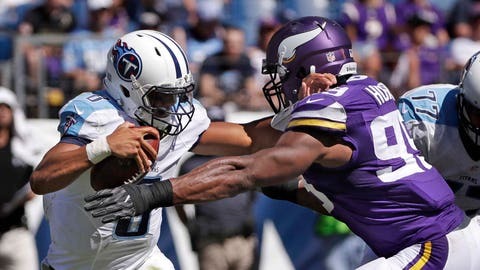 A breakdown of lessons learned, players of the game, key moments and more from the Minnesota Vikings' comeback victory over the Tennessee Titans. — Trae Waynes started in place of Xavier Rhodes, who was limited in practice last week with a hamstring injury. He was one of five players to play on all 67 of the Vikings’ defensive snaps, and matched up primarily with rookie Tajae Sharpe, who had seven catches for 76 yards.